A charming kind, delicate both in foliage and flower, usually growing in shady, mountain woods. The slender bush is from one to three feet high, with dark brown stems, armed with some straight, slender thorns, and light green leaves, usually with quite a number of neat little leaflets, smooth and thin in texture. The flowers are an inch or less across, usually single, with light yellow centers and bright pink petals, very clean and fresh in tone, usually deeper towards the margins. 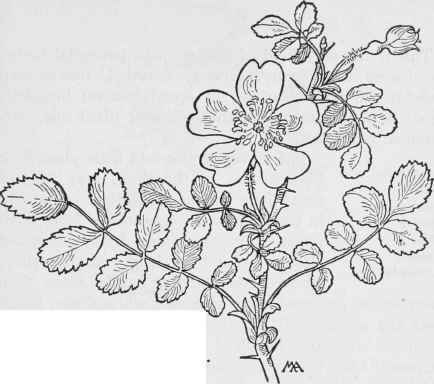 The sepals are not leafy at the tips, the flower-stalks, and sometimes the leaf-stalks also, are covered with small, dark, sticky hairs and the buds are tipped with carmine. Neither leaves nor flowers are fragrant.